Wood is full of surprises. I had just finished bringing a beautiful butternut dulcimer soundboard to final thickness when I noticed some odd-looking marks in the wood. Ends up there was a bit of deep checking inside that wasn’t revealed until I got it to final thickness. Wood often has flaws and flaws are part of the wood’s beauty. Sometimes the flaw is merely cosmetic and adds beauty to the wood, sometimes the flaw is structural and decreases the strength of the wood. In this case the flaw was a checked (cracked) area about an inch wide that went completely through the soundboard. This flaw across the grain weakens the top enough to make it unusable. I am happy I learned this soundboard was unusable before putting the dulcimer together! There are often surprises within a board but I usually find them much earlier in the process. This one almost made it into a dulcimer! I probably would have discovered it before the dulcimer was finished but that would have meant a lot more time and work. It is much easier to replace a soundboard before the dulcimer is put together! Sometimes wood is very cooperative. 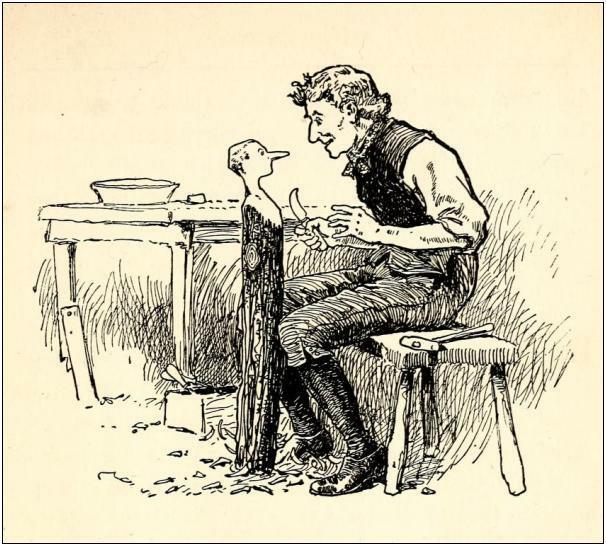 In the illustration below a piece of wood is telling a dulcimer maker that it will indeed make a fine dulcimer. Wood that talks often has wonderful resonant qualities. It is important to make sure the wood speaks the proper language for the music you plan on playing on your dulcimer. If you play French dance music you want your dulcimer made out of wood that speaks French, etc. There is a tradition of shipping logs around the world for many years so the wood becomes multilingual and can play most types of music. All this time and travel makes multilingual dulcimer wood very rare and costly. I see another quiet night next to the fireplace with your butternut! Well, the butternut I used to make the next top had some flaws too. I think I’ll have to toss 5 or 6 of them as they all came from the same board. I did start making a lovely Sitka spruce top for said dulcimer and this one looks fine! I wondered how you got started. Of course that piece of wood above was lying. Actually, it was! I started working on another piece of butternut and it had structural flaws too. If you can’t trust a talking piece of wood who can your trust! Large pieces of Blackwood are about 20% unsound. I can usually work around the issues, but that involves cutting the bits up into pieces 5-10% of the cost of the original piece. Just the price of doing business. It did look pretty, but so does the piece I’m replacing it with! I imagine that butternut sure looked pretty. I think you should carve a full sized human head on your next dulcimer. I love it, multilingual wood! Ship mine to Quebec please!